Do you love freebies?! 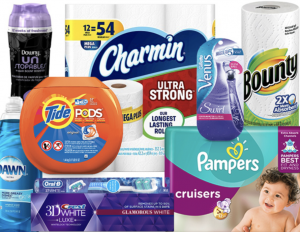 Simply text Follow CouponProHOT to 40404 to receive FREE Coupon Pro Text Alerts with the HOTTEST freebies, coupons and deals available delivered right to your mobile phone that way you never miss deal. Text alerts are hosted by Twitter (if you have Twitter scroll down for an easier set up) so you can ignore any random “Twitter” text immediately after sign up. We promise to only send you the very best, awesome, hot, amazing offers possible, which is about 0-4 texts per day. Plus, exclusive giveaways and freebies for our text alerts community. Reply “STOP” to unsubscribe at any time. Standard text message rates apply but this service is 100% totally free! 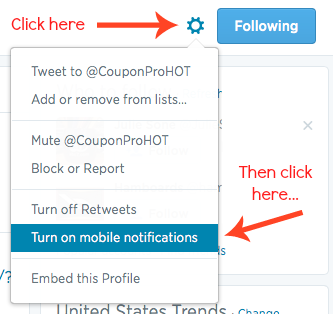 Create a Twitter account, simply follow the CouponProHOT Text Alerts page > click the drop down menu wheel on the top right then Edit Profile > click Mobile > Add your phone number > Click the drop down menu (as shown above) > Then click Turn on mobile notifications > Done!